Volcan de Acatenango was definitely the highlight of our Guatemala trip. 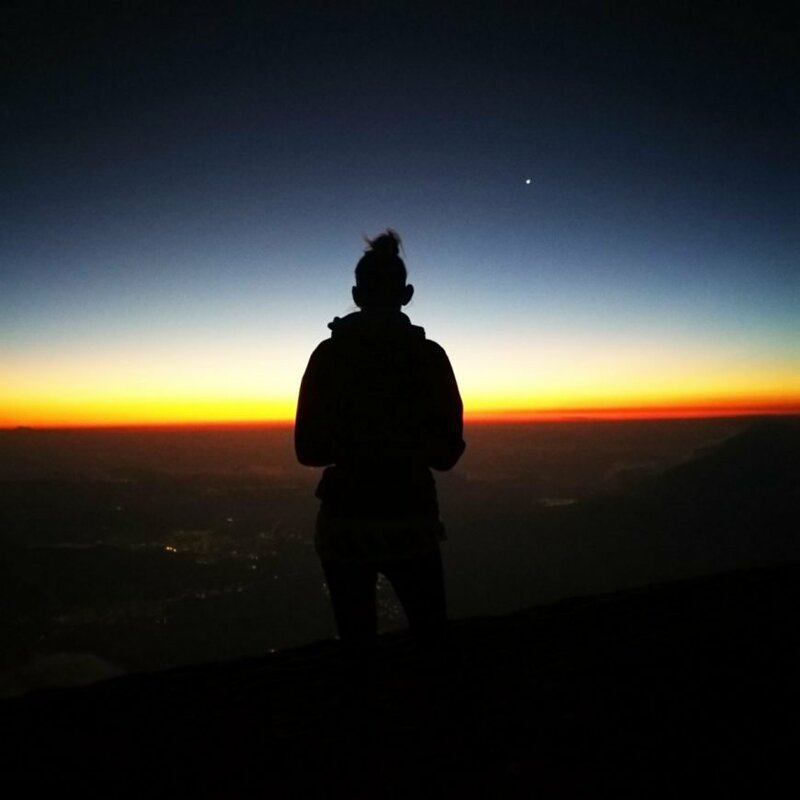 Hiking up to a dormant volcano that is still peacefully puffing away to watch the sunrise, with views for miles was just completely magical. We came away from this hike feeling amazed, accomplished & exhausted but loved every second of it. 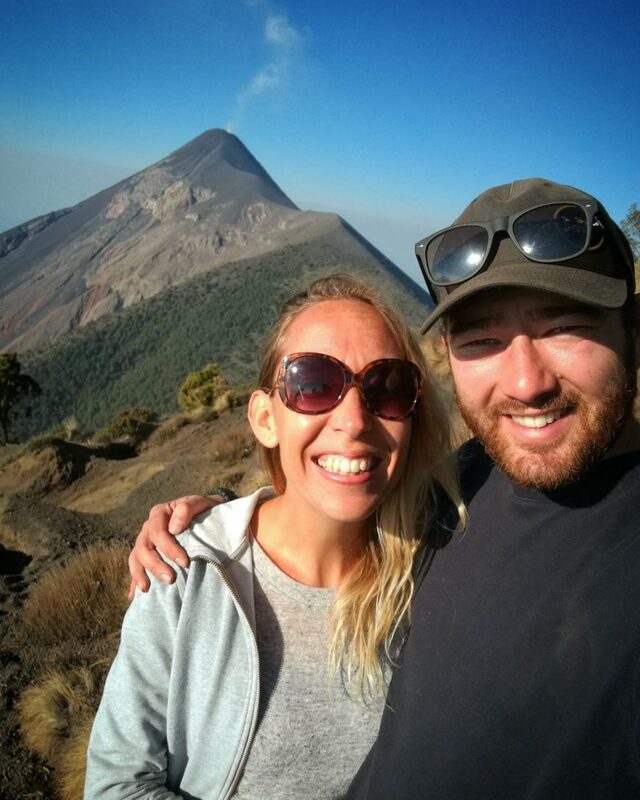 Here’s more about how we hiked Acatenango & why we think you should too…..
We booked our tour through MATIOX the hostel where we were staying in Antigua, the total cost was 185 Q per person including transport, equipment, guides & some food. 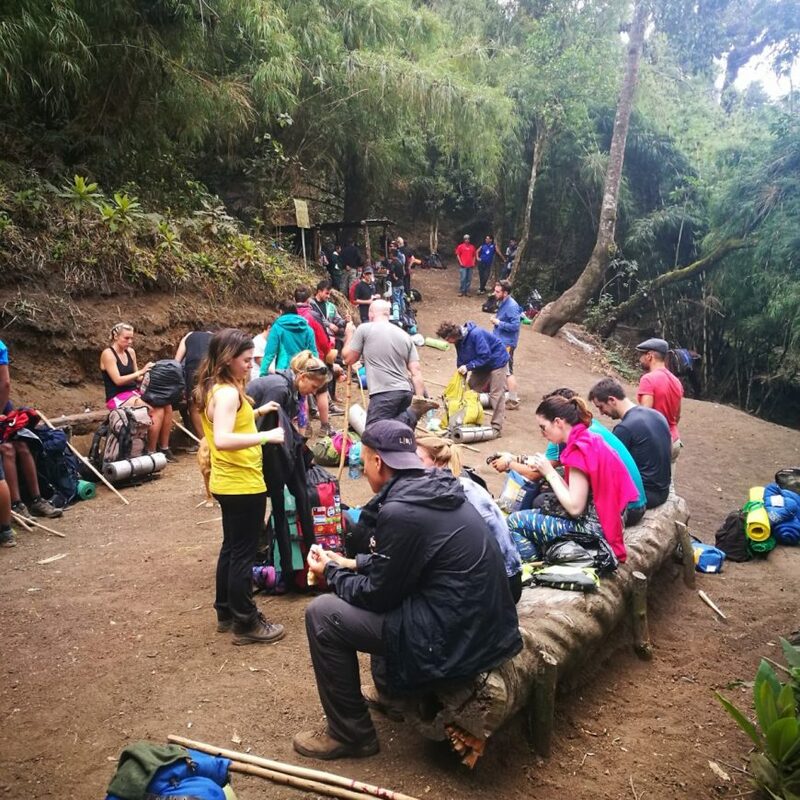 We thought this was really great value for an overnight hike, you can opt for tours around town that are more expensive & supposedly better, with more guides allocated per person & better food given but we found ours sufficient enough for given it was just for one night. The ease of booking & cost to explore such an amazing landscape in such a short space of time are definite plus points if considering this adventure whilst in Antigua. 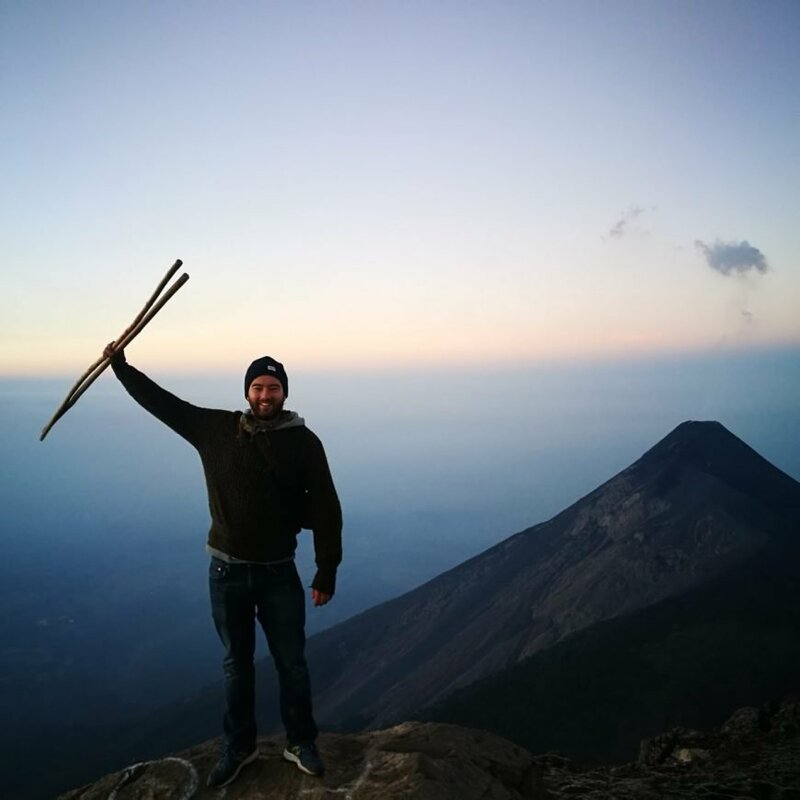 **Our top Volcan de Acatenango pre-hike tips** Bear in mind that you will need to carry the provided sleeping bags & part of the tent you will sleep in, a large backpack will be required. It is very cold at night so take as many extra layers as you can fit in, although food is provided it is not great & there is not a lot of it, take plenty of snacks with you & remember to take enough water too. We both love to challenge ourselves & this hike definitely did that for us. The terrain is tough, you are hiking up to a volcano so the ground is mostly rocks & ash which makes for quite a lot of slipping! As well as this its uphill the whole way, all 6 hours of it on day 1 & with all the stuff we had to carry added to this it was pretty hard going! The challenge is all part of it though & for us is what makes it all worthwhile! When you start out the hike with a group of strangers & throughout it all work to help each other get through the difficult parts you build bonds & get to know people. You leave as a team, having achieved something, together. In no way was this the most glamorous camping we have ever done, in fact it was probably our least glamorous camping experience! Adam & I shared a tent with 2 other people & to be honest we were really grateful for the body warmth! We all sat there with wearing every item of clothing we had with us, eating snacks & drinking whiskey then gathering briefly around the campfire for a dinner of a pot noodle, it was cold, we were exhausted but we were all still smiling, we had made it to our spot for the night & only had a short hike in the morning so see what we had come for – Volcan de Acatenango. We were woken up by our guides whilst it was still dark & made the steep & slippy climb up to the very top, the views were just incredible you could see the whole city of Antigua & miles further too, just all lit up & so still. As the sun started to rise we reached the top. To say this was the most epic sunrise we have ever seen is an understatement, the feeling of being up so high with the clouds floating below us & a fierce, burning sun rising in the sky ready to light up the whole world was just something else. 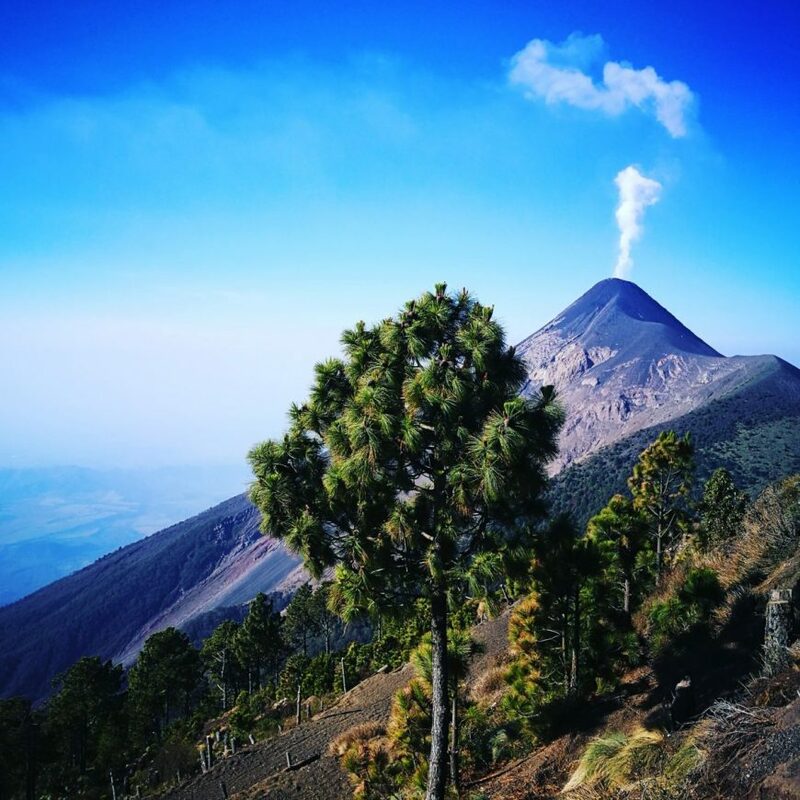 The sunrise blew us away but the icing on the cake was there, dominating the landscape, the mighty Volcan de Acatenango stand tall, puffing away. 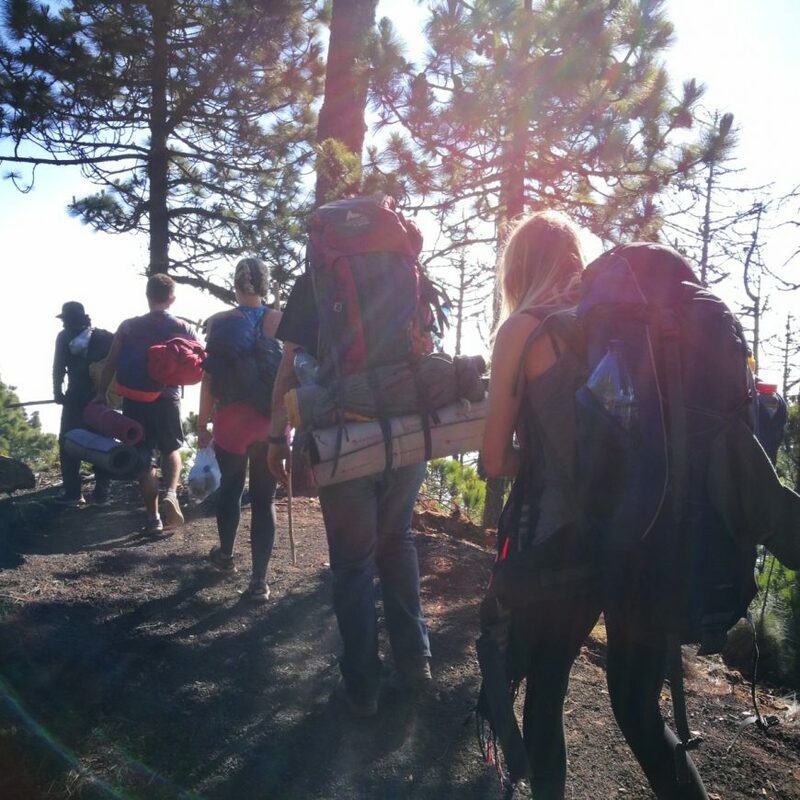 The feeling of being totally encompassed in our surroundings that morning was what made that hike so incredible, stood together with beaming smiles, our minds fuzzy, just taking the whole thing in was a truly unforgettable experience. 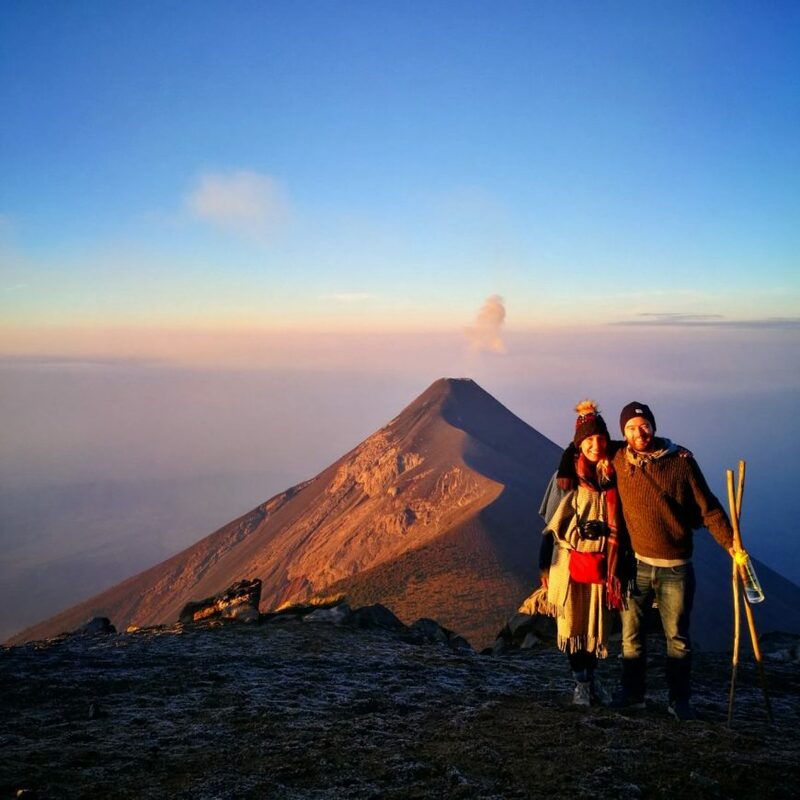 Those moments when travelling, the ones where you are totally in the moment, nowhere else but the here & now, the ones that you will never, ever be able to re-create are the most special as we hold them in our hearts forever & that’s the reason we think you should hike Acatenango too! 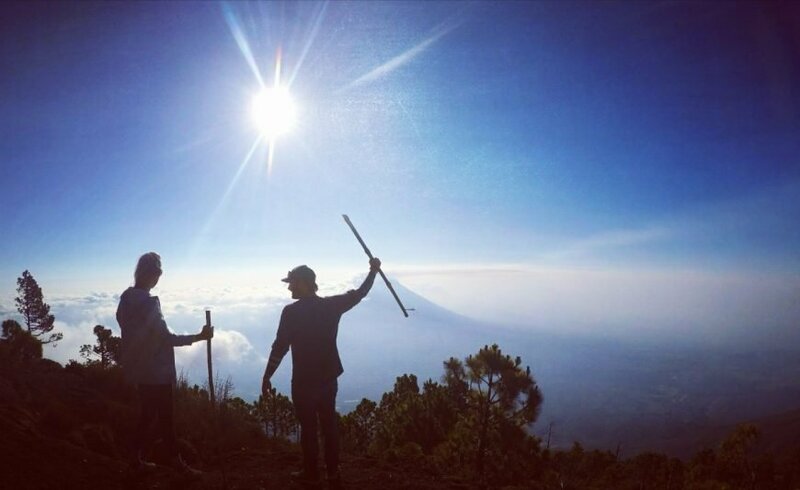 Volcan Acatenango is the third-highest mountain peak of Central America by elevation! 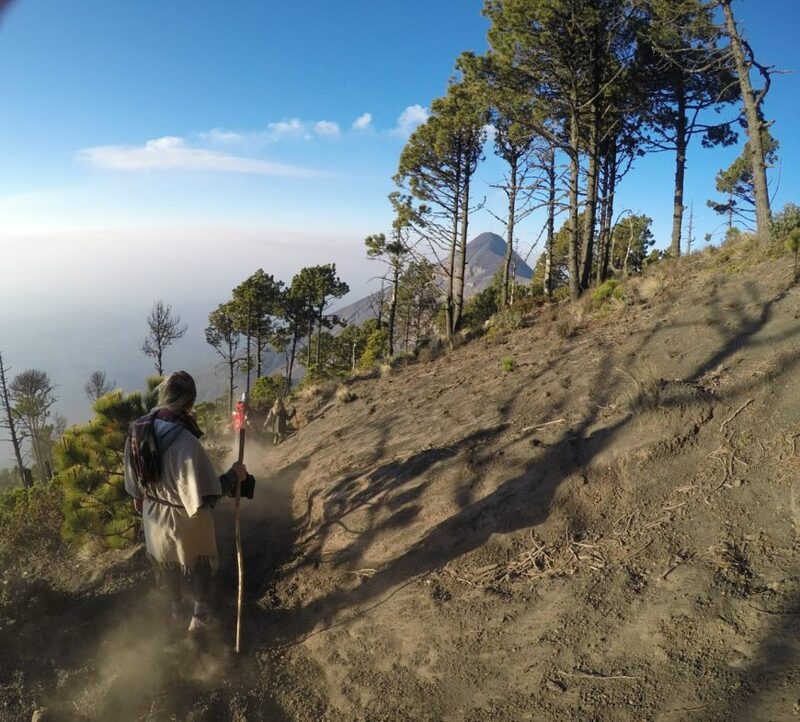 Have We Convinced You To Hike Acatenango? We really hope if you are heading to Antigua soon we have given you enough exploration inspiration to take on this mighty hike or if not we have managed to add it to your “one day” wishlist. As mentioned we stayed at MATIOX hostel which we would highly recommend. Great vibe, nice staff and really clean and friendly hostel. We met some really nice people there and had a blast! Do you have any questions for us at all? Have you experienced this too & have anything to add? We would love to hear so please tell us in the comments! 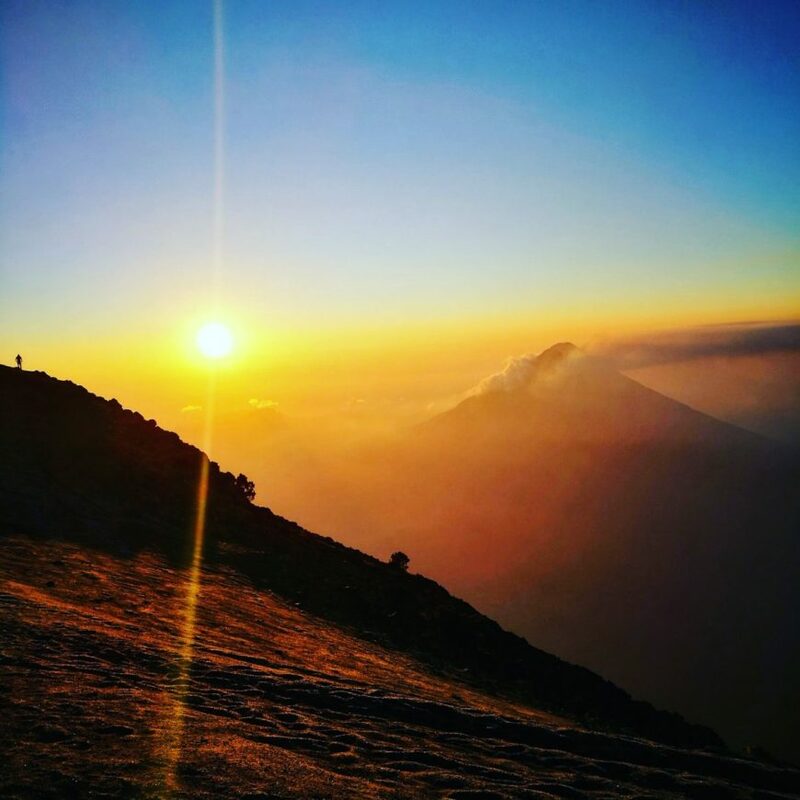 This entry was posted in Guatemala, Hiking, Inspiration and tagged Antigua, Volcan de Acatenango. 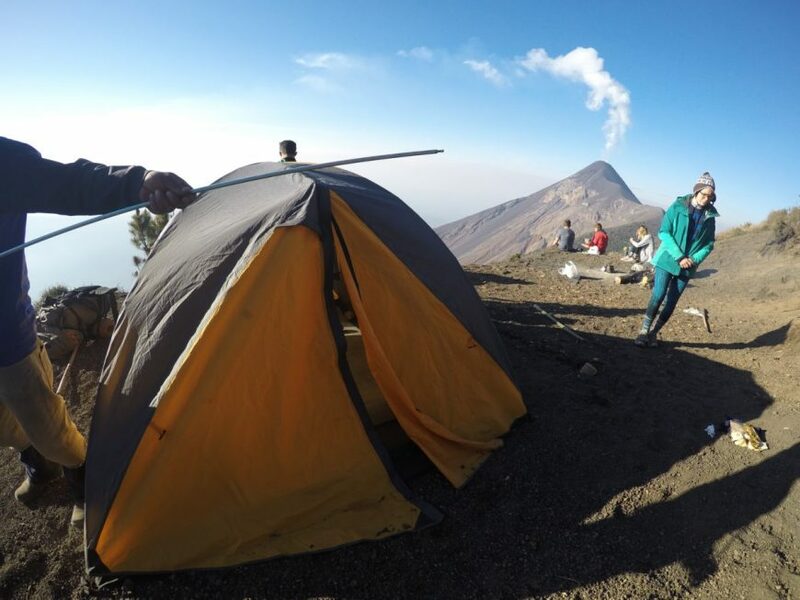 I love volcanoes, we want to hike more of them:) This looks amazing, I’m not sure about the sharing a tent with 2 other people though! It was such an amazing experience, you guys would love it 🙂 I think if it was any more than one night I may have struggled to be in such close quarters!